taught trumpet at Western Carolina University since1989). Dr. Ulrich received his Bachelor of Music Degree in Trumpet Performance from the Florida State University where he studied with Byron Goff. His Master of Music and Doctor of Musical Arts degrees in Trumpet Performance and literature were awarded from the University of Illinois, Champaign-Urbana, where he studied with Ray Sasaki and Michael Tunnell. He has also studied with Raymond Mase, George Vosburgh, Adolph Herseth, James Thompson, and Vincent DiMartino. Champaign-Urbana Symphony (IL), Sinfonia da Camera (II,), and the Cedar Falls Waterloo Symphony (IA). In addition to his orchestral experience he has performed numerous recitals in the Southeast with the Smoky Mountain Brass Band, one of Western North Carolina’s finest brass quintets, and has also been a featured soloist with the Brevard Chamber Orchestra. Dr. Ulrich has published numerous articles in the International Trumpet’ Guild’s Journal and since 1999, has been the Public Relations Director for ITG. Brad is an Educational Clinician and member of the Product Advisory Council for Jupiter Band Instruments Inc. The cornet is easier for a beginner to hold in the correct position because its tubing is wrapped tighter, making the instrument’s overall length shorter. It is easier for the beginner, with short arms, to balance the cornet and hold the instrument for longer periods of time. When the instrument is held at the correct angle it becomes easier to achieve the proper embouchure and the overall tone production will be more pleasant. With the proper instrument balance the student will be able to use the first and third valve slides more easily to adjust flaws in pitch. The cornet has a naturally mellow sound that can give the student a better concept of tone. The cornet has a conical bore verses the more cylindrical bore of the trumpet. Consequently, cornets are easier blowing. Particularly important when you consider beginning students usually have 1 to 11/2 liters of air (most adult trumpeters have 4-6 liters). 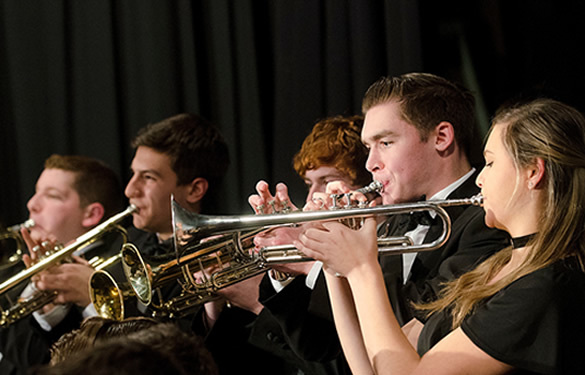 Though cornets offer beginning students the easiest and most comfortable opportunity to develop skills, trumpets are the more common performance instrument offering a wider range of tonalities, and abilities. In performance opportunities cornets are most appropriately suited for British Brass Bands, while trumpets offer the ideal tone colors for “American” music including symphonic, jazz, and brass ensembles. – Display of excellent daily warm-up routine. Students are generally ready to switch to trumpet after two years of study. Reasons for quitting an instrument include: too hard to play, too big and weights too much, don’t like the sound, it’s boring, it’s dumb, I don’t like it. Beginning string players start on smaller instruments; flute players use curved head joints to reduce the size of the instrument; tuba players begin on 3/4 size instruments or euphoniums. Try to avoid using the word “hard”, or “difficult” when referring to techniques, range on the trumpet, or passages in music, as this will create mental blocks for the student. Also avoid the phrase “high note” as students tend to equate it as being more difficult. Try to mention positive aspects of a student’s playing before introducing constructive criticism. Nothing is more important than starting students off correctly! Posture, breathing, mouthpiece buzzing warming up, and attention to pitch should be taught from the beginning. It is easier to teach correctly from the beginning than it is to correct bad habits! The student should sit or stand with an arch in their lower back, chest held high and neck straight. Good posture can be achieved by having the student stand up straight, stretching their arms up over their heads. Lower the arms out to the sides (9 and 3 o’clock position) keeping the chest high. Next, lower the arms all of the way down to the sides keeping the chest in the high position. This should achieve the correct posture which is used when standing or sitting. Starting each session with breathing exercises is imperative! Students should be striving for a low-pitched “HAW” sound on inhalation. An invigorated yawn is another way to gain a correct breath. A good sounding breath is a good breath! 3/4″ PVC pipe cut 3″ long placed in the teeth will remind the students of the deep sounding inhalation required. Breathing should be done in time with the music. Make sure that the breath is exhaled immediately after inhalation (no hesitation). The only sound one should hear in the inhalation process is a low-pitched “HAW”. Below are some examples of breathing exercises that should be used each day. Students must also work on mouthpiece buzzing every day. The better the buzz, the better the tone, intonation, and pitch accuracy on the instrument. At first, beginners should be encouraged to buzz on any pitch. It is difficult for beginner to match pitch right away. 1\ good buzz is one with as much vibration as possible (the buzz should sound like a swarm of bees). Have the student playa “siren” buzz on the mouthpiece starting very low and glissing as high as they can and then back down. Be sure to stress a strong vibration at all times in the buzz. Over time, the student should begin to match pitches. This can be accomplished by playing a pitch on the piano, having the student sing the pitch and then match it on the mouthpiece. Simple melodies, with a strong, consistent vibration and attention to intonation should then be buzzed. When the student has mastered these basic buzzing suggestions they should progress to wider intervals. An airy tone is often an indication of the aperture of the lips being too wide. Correct this by having them use much more air and firming the corners of their mouth. The embouchure is too tense. RELAX! Following breathing and mouthpiece buzzing exercises, the student should perform exercises | incorporating long tones, simple flexibility, and articulation. These exercises can be elementary variations on the chromatic scale or major scales and arpeggios. Most beginning method books include exercises in each of these areas. To receive a complimentary warm-up sheet, contact Dr. Ulrich at Ulrich@email.wcu.edu. The 3rd valve slide should be extended approximately 1/2″ on low D and I” on C#. D”, E-flat”, and E” are inherently very flat notes on the cornet/trumpet. A simple fix is to have the student raise their eyebrows on these notes! Using faster air and changing tongue placement by pronouncing “ee” will also help to raise the pitch. through the instrument will energize the sound and keep the pitch from sagging on long tones. As the student descends, they should hold the pitch up. As they ascend, they should hold the pitch down. Not only will this correct some basic intonation problems, but it will also help center their tone. Students should be taught NOT to use the “pinky” ring on the leadpipe. Using this ring will create tension in the 3rd valve finger and slow down its motion. Keep the fingers on the right hand rounded. The pads of the fingertips should remain in contact with the valve buttons. Keep the wrist of the right hand straight. Bending the wrist will create unwanted tension.